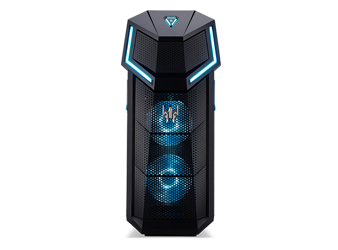 Sharply defined angles silhouetted against shale black metal – lit up by the RGB case fans – houses everything your gaming heart desires. The result of pairing the overclockable 9th Gen Intel® Core™ i9-9900K Processor* with two GeForce® RTX 2080* GPUs over an NVLINK™ bridge? Blisteringly fast performance that decimates any and all challenges. Exceed every expectation with a case streamlined for thermal dominance with IceTunnel 2.0 Airflow Management and Cooler Master®’s AIO CPU Liquid Cooler*. * Specifications may vary depending on model and/or region. All models subject to availability.